Scott Reed, vice provost for OSU University Outreach and Engagement, and Stephen Percy, dean of the College of Urban and Public Affairs at Portland State University, created an OSU-PSU Collaboration Fund, to offer start-up funds for joint pilot projects between OSU and PSU faculty. Healthy people, prosperous communities and flourishing agriculture and natural resources are the three areas of focus of the initiative. 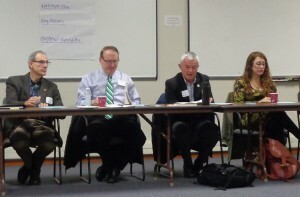 You can learn more about the meeting and initiative in the November 23 post on the O&E Blog. The fund is meant to accelerate opportunities for research collaborations serving Oregon communities. Recognizing that these experiences often require extra resources beyond faculty time, the fund offers seed monies to faculty teams for fiscal year 2015-2016 to support expenses associated with community-engaged inter-institutional projects. Review of the submitted proposals was led by Patrick Proden, regional administrator for OSU Extension in Multnomah and Washington counties, and Sheila Martin, director of the Institute of Portland Metropolitan Studies at PSU. Grant funds must be expended by June 30, 2016. This grant is important in leveraging Portland State University’s participation with Oregon State University on a project to examine farmland tenure and access issues in Oregon. Specifically, this project will lead to a better understanding of patterns in recent farmland transfers in four pilot counties (Benton, Clackamas, Polk, and Washington). A second objective is to understand the implications of different farmland ownership models on local food systems. A final objective is to engage stakeholders in a dialogue about the feasibility of strategies to enable access to farmland by aspiring farmers. Citizen science, the practice of involving volunteers in scientific research, has drastically increased in popularity. Despite the documented benefits to both volunteers and researchers, citizen science has yet to be formalized in Extension education and volunteer efforts. This collaborative project will coordinate OSU and PSU graduate and undergraduate students to develop an online citizen science training program targeted to OSU Extension Master Gardener volunteers. Through this program, future volunteer citizen scientists will learn the scientific method and process and be trained to assist scientists at PSU, OSU and beyond with future ecological research in community and private gardens. Relative to their surroundings, urban landscapes are more fragmented, paved, polluted and warmer, which influences biodiversity, crop development and yield in urban farms and gardens. We currently lack a basic understanding of the biodiversity and abiotic conditions of urban agriculture sites. Underlying all of these factors are the motivation, knowledge and socio-economic status of urban farmers and gardeners, and how these relate to management practices, ecosystem services and yield of urban agriculture sites. We will work to identify funding opportunities and develop a competitive proposal to collaborate on a multi-year socio-ecological research program serving urban home and community gardeners. Posted in Community Outreach, Extension, Partnerships. © 2019 University Outreach and Engagement, all rights reserved.